Imagine a spacious coastal valley, separated from the Mediterranean sea by tall sand dunes. At its centre lies a swampy lake, surrounded by a small plain which is overlooked by hills on three sides. And all of this scenery is literally filled with ancient ruins: millennia-old roadways, vaults, arches, walls, pillars and entire buildings everywhere, some barely sticking out of the ground, others excavated and restored, and the soil between them littered with vast quantities of broken pottery. 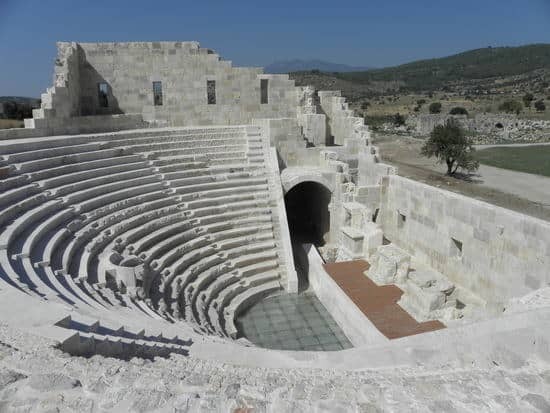 This is Patara, one of the most impressive and most fascinating among the many archaeological sites in Western Lycia on the southern shore of Turkey, and one of the highlights on our escorted tours and gulet cruises in the area. The sheer extent of the ancient city is enormous, the preservation of its remains unusual even for Turkey, a land abounding in astonishingly well-preserved sites. 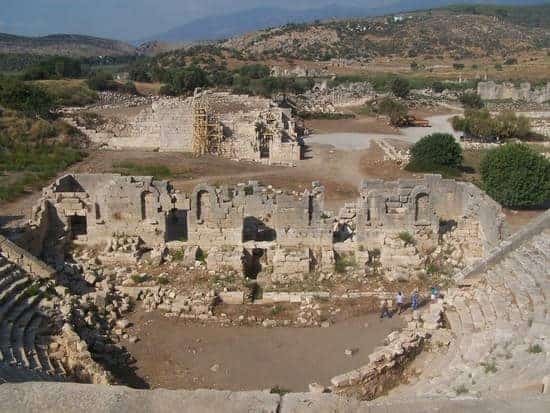 Nonetheless, Patara is hardly a household name even for adepts of archaeology or of the ancient world, unless they have travelled in the area. Student textbooks on Greek or Roman architecture do not usually mention the site and even advanced literature does not necessarily refer to it. Why? Probably for two reasons. 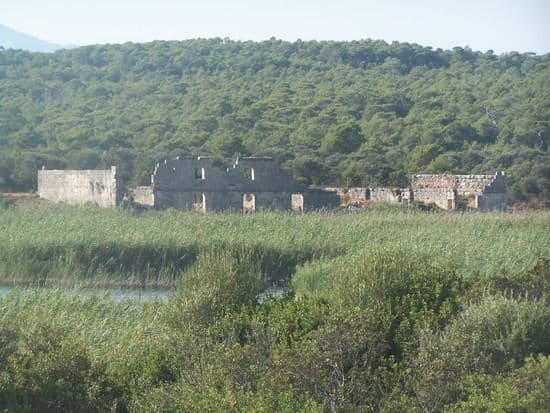 Firstly, the site, although known to scholars since the 19th century, used to be covered in windblown sand and has only been subject to systematic excavation (by Turkish archaeologists from Antalya University) since 1988 (in scholarly terms, that is recent). Secondly, and perhaps more importantly, Patara is a place of moderate, not huge, historical significance: it does make the occasional appearance in ancient literature, but scarcely enough. There was probably a religious sanctuary at Patara already in Hittite times, in the 2nd millennium BC. 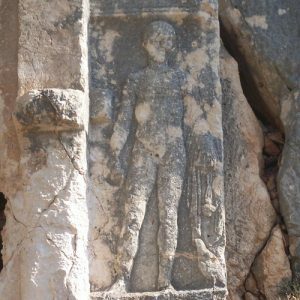 We have no idea what deity would have been worshipped there, but we do know that a thousand years later it was an important oracle associated with the god Apollo, as its first historical mention by the great Greek historian Herodotus in the mid-5th century BC indicates. Supposedly settled by Cretans, Patara appears to have initially functioned as the harbour for Xanthos, the occasional capital of Lycia, from the 7th or 6th century BC. It is not mentioned in the late 5th century BC Athenian tribute lists, which is hardly surprising, as the Xanthians appear to have defeated an Athenian force trying to exert contributions to the Delian League. Along with the rest of Lycia, it surrendered to Alexander the Great in 334 BC. It is in the ages after Alexander, in the Hellenistic and Roman periods, that Patara reached the height of its importance, primarily as a naval base. First used by the Macedonian kings, it later fell to the Ptolemaic rulers of Egypt, later to the Antigonids of Syria, probably also temporarily to Rhodes and eventually to Rome. 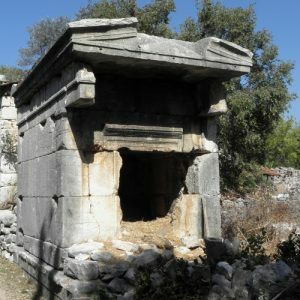 From the 2nd century BC onwards, it was the nominal capital of the Lycian League, an early federation of city states designed to retain a certain degree of local control during the complex struggles of that period. 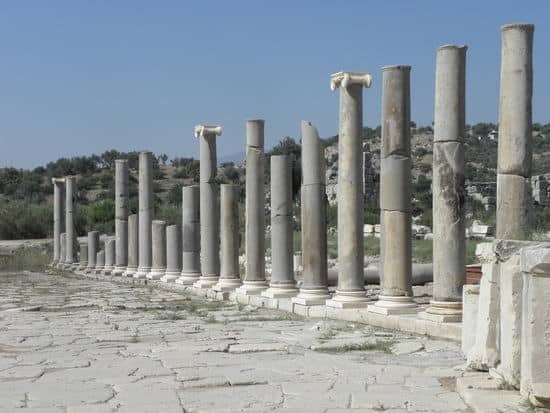 The city appears to have thrived in Roman times, especially in the first few centuries AD, when it eclipsed Xanthos. St. Paul reports to have changed ships at Patara and the city certainly became an early centre of Christianity in the region. 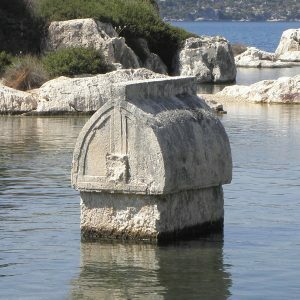 St Nicholas of Myra was born at Patara. The city was probably abandoned in the Middle Byzantine period, never to be reoccupied as an urban settlement again, which is why its remains, never built over, never quarried and eventually covered by sand, are so well preserved. So, our reader may ask what there is to see at Patara. Our writer has to ask where to start. There is a whole ancient city there, scattered over an area well beyond a square kilometre and inviting thorough exploration. 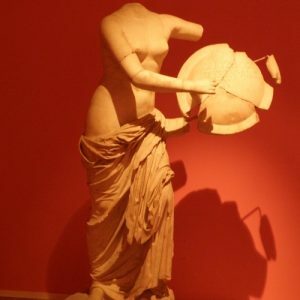 Most of the archaeological remains now visible are from the late Hellenistic and Roman periods. The obvious highlights include a particularly grandiose theatre, the recently restored bouleuterion or council house, which appears to have been the seat of the assembly for the Lycian League, several Roman baths, the ancient colonnaded main street, a Roman monumental city gate, walls from various periods, the 2nd century AD horreum (a storehouse for grains and other goods used by the Roman army), a Byzantine (?) fortification incorporating a Roman or earlier temple, and last but not least, the foundations of one of the very few lighthouses surviving from antiquity (currently undergoing restoration). Further afield, there are graves and cemeteries ranging from prehistoric to Late Roman times. Even more importantly, the Roman aqueduct that supplied Patara with fresh water from mountainside sources stretches for nearly 20km, including a section where it runs downhill first and then uphill, using the inverted syphon principle unique to the most sophisticated Roman water supply systems. Intrigued? You can visit Patara easily from Kalkan, a major resort town on the coast of Lycia. Of course, the best way to explore such a large and complex archaeological site is to come prepared, having read up in advance. Even better, we can show you around there on no less than six escorted tours this year: our 2-week gulet cruise of the Lycian shore, our family cruise in Western Lycia (not running in 2015, when we offer a family trip in Caria instead), our Cruising Western Lycia, as well as our escorted 2-week walking cruise of the Lycian Shore and our 1-week walking cruise of Western Lycia.